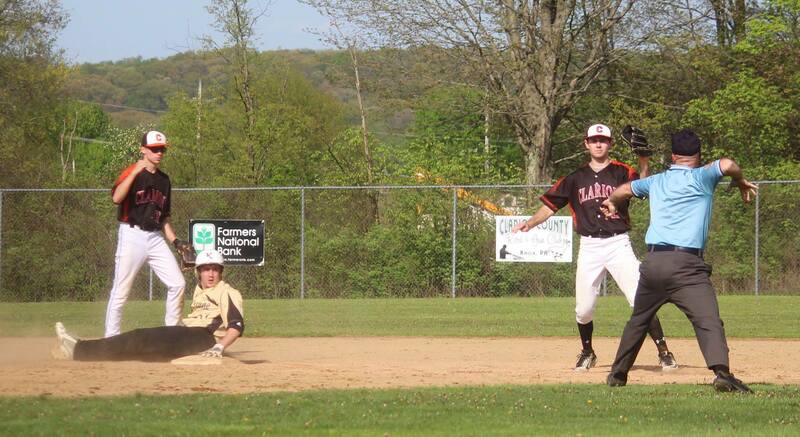 Nick Frederick on third. He had two singles and three RBI. 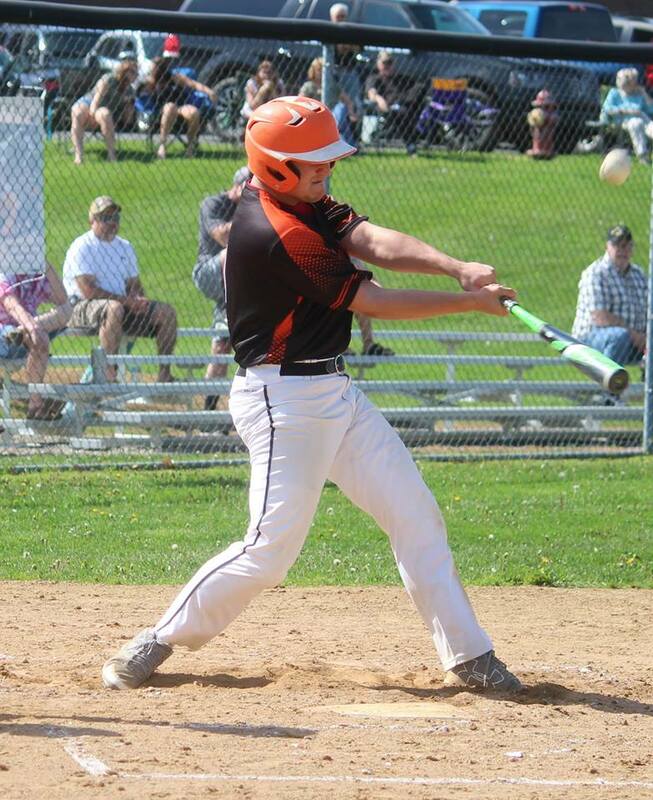 (By CSZ Sports Writer Kenn Staub) Clarion closed out the 2018 regular season with a 13-1 thumping of the Keystone Panthers on Thursday, May 17 in Knox. The win was the Bobcats’ fourth in a row and their sixth in the last eight games. A scoreless first inning in no way foreshadowed Clarion’s offensive explosion during the second, a frame in which they sent 15 batters to the plate, rapped eight hits, and scored ten runs. Nate Datko got things going with a one out hit to left, the first of four consecutive singles. Cutter Boggess’s hit pushed Datko to second, after which Drew Whren plated Datko and moved Boggess to third with a liner to right. A Nick Frederick poke to the right side cleared the bases, making the score 3-0. Frederick, who had gained second on a bad throw from the right fielder during his run scoring hit, was awarded third on a balk. Cal German followed Frederick by working a full count walk. Frederick scored and German moved to second when a Spencer Miller grounder to third was misplayed, giving the Bobcats a 4-0 lead. Drew Whren had two singles and an RBI. With runners on first and second, Cam Craig singled, scoring German and moving Miller to second. Sterling Conner was hit by a pitch to load the bases for Skylar Rhoades. Rhoades grounded into a fielder’s choice, a play which scored Miller from third but that saw Conner thrown out going to second. Datko, batting after Rhoades, knocked his second single of the inning, scoring Craig from third, to put Clarion ahead 7-0. Rhoades got third and Datko second on the throw in from the center fielder. A wild pitch during Boggess’s at bat scored Rhoades while Datko scrambled to third. Boggess subsequently singled to left, plating Datko. Whren singled, moving Boggess up one. Frederick notched his second RBI single of the frame, scoring Boggess for the Bobcats tenth and final run of the inning. Neither team would score in the third. Keystone would get their only run of the game in the bottom of the fourth. Clarion added three more to their lead in the fifth, the product of a two out home run over the left field fence by Conner. A Keystone runner is called out attempting to steal second in the fifth inning. Keystone would threaten in their half of the fifth. A one out walk to the second batter of the inning was nullified when Clarion’s catcher, Lake Staub, threw out the runner as he tried to swipe second, his team leading third caught stealing of the season. Another walk and follow-up single would give the Panthers runners on first and third, but the inning ended when the fifth Keystone batter of the frame grounded out, giving Clarion a 13-1 ten-run rule victory. The Bobcats tallied eleven hits on the day, all of which, with the exception of Conner’s homer, were singles. Datko, Boggess, Whren, and Frederick each had two hits, with Miller, Craig, and Conner rapping one apiece. Conner and Frederick both had three RBI, while Miller, Craig, Rhoades, Datko, Boggess, and Whren were each good for one. Skylar Rhoades started the game and retired all six batters he faced, four by strike out. Rhoades pitched the first two innings, earning the win, his fourth of the year. 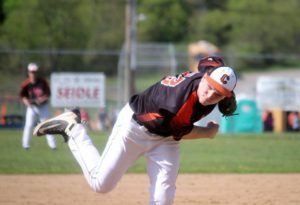 He struck out the side in the first inning and one of the three batters he faced in the second. Skyler Pastor threw the third and fourth for Clarion, surrendering a run and striking out one. Boggess pitched the final inning, striking out one. With the victory, Clarion finishes the regular season with a 10-7 overall record, 10-3 in the Keystone Shortway Athletic Conference (KSAC). The Bobcats’ record against Class A teams (like themselves) is 7-1. Clarion, the 21st ranked Class A team in the state, enters the District 9 play-offs as the third seed. 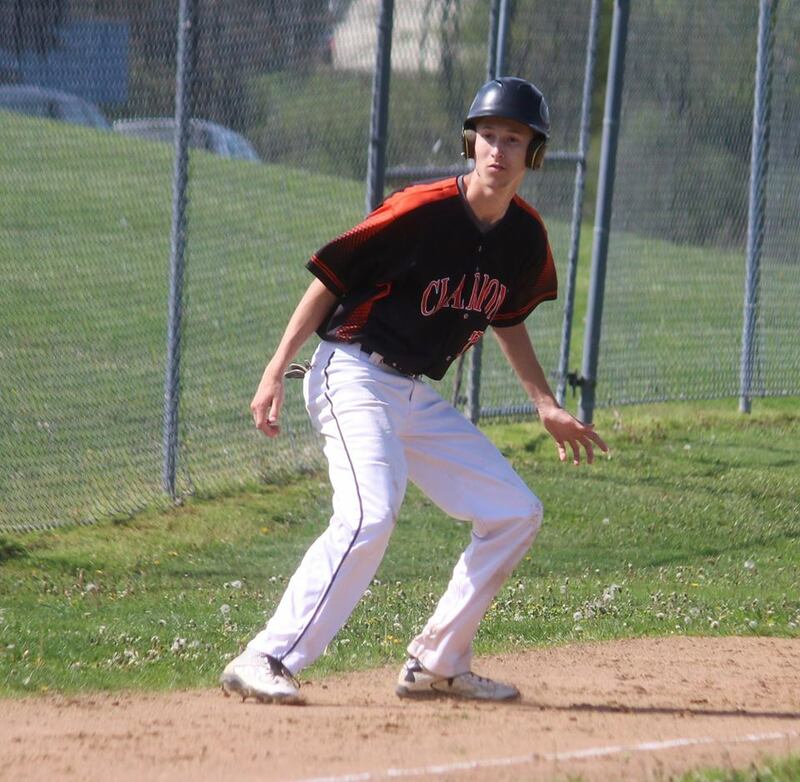 Weather permitting, the Bobcats will open postseason play at County Park on Tuesday, May 22 against the Clarion-Limestone (C-L) Lions, the sixth seed. Game time is scheduled for 4:30. C-L has an overall record of 6-7, 5-7 in the KSAC. They have a 5-4 record against Class A opponents, with two of those losses coming at the hands of Clarion. The Bobcats downed the Lions, the 49th ranked Class A team in the state, 12-1 in a ten-run rule shortened game on May 2 and 3-0 on May 11. The winner of the C-L/Clarion game will play the winner of Tuesday’s Cameron County Raiders/Dubois Central Catholic (DCC) Cardinals game on Thursday, May 24 at 12:00PM. Cameron County (6-10 overall) enters the District 9 play-offs as the seventh (last) seed. DCC, the second seed, has an overall record of 13-6. They are the 10th ranked Class A team in the state. Oswayo Valley is the first seed in the District 9 play-offs. The Green Wave have an overall record of 16-1 and are ranked 12th in Class A. The other District 9 Class A play-off teams are the Elk County Catholic Crusaders (8-12 overall, fourth seed) and the North Clarion Wolves (6-7 overall, fifth seed). Three teams from District 9 will qualify for the PIAA Class A playoffs. These include the two teams in the championship game, scheduled for May 29, and the winner of a consolation game between the semifinal losers (also scheduled for May 29). The winner of the consolation game will take on the District 10 champions in a PIAA play-in game scheduled for Thursday, May 31.